The last minute decision to book late flights to Malaga in Spain to join an Aussie friend touring Europe was not taken lightly. Firstly, I had never had any previous interest in visiting Malaga, or the popular towns nearby such as Marbella or Puerto Banus. I’d really only considered these as trashy tourists towns for Brits or flashy Europeans. Secondly, last minute, these flights to Malaga were £200! Certainly not a price I pay frequently for 48 hours in a destination. Yet I really wanted to see my friend and since I’m always open to exploring new destinations, I purchased the flights and headed off to Gatwick on a sunny July Friday evening. I was so pleasantly surprised with both towns, especially Marbella and can now 100% see the draw for returning visitors. The town is easily walk-able, the food fantastic, the beach long and expansive and actually, Marbella is surprisingly untacky! So if you’re considering a weekend (or longer) here, or are simply looking for some weekend inspiration, then check out my post below! Quick lesson learnt here: do not land late (after 10pm) if you’re not prepared to pay for a taxi. Our (BA) flight was delayed so I found myself at Malaga at midnight, long after the last bus had left. I had to ask around in the taxi queue to find myself new friends to make it to Marbella. A taxi to Marbella costs around 70-80 euros, but onwards to Puerto Banus could be around 120-140 euros! Arriving into Marbella at 2am was surprisingly fine, with Google Maps directing me with the way through its tiny lanes. The streets were busy enough and I felt completely safe. There’s a huge array of accommodation options in Marbella, but I would say the majority of options cater to fairly high-end budgets. Walking along the beach promenade, I could definitely see some lovely hotels and apartment blocks. We stayed in a small brand new hotel in the Old Town called BOHEMIA. It had only opened 3 days beforehand so there were a few teething problems, but on the whole, it was a great spot. Marbella is really well known for its all day pool parties and glitzy gatherings, yet we managed to avoid all of this. The Old Town of Marbella was absolutely gorgeous, with a really wonderful atmosphere. It was so beautiful, full of tumbling bougainvillea and tiny little laneways. We fell in love!! Plaza de los Naranjos is at the centre, and we found ourselves there for breakfasts both days. Arriving around 9am both days meant we got to enjoy the beautiful square almost to ourselves! 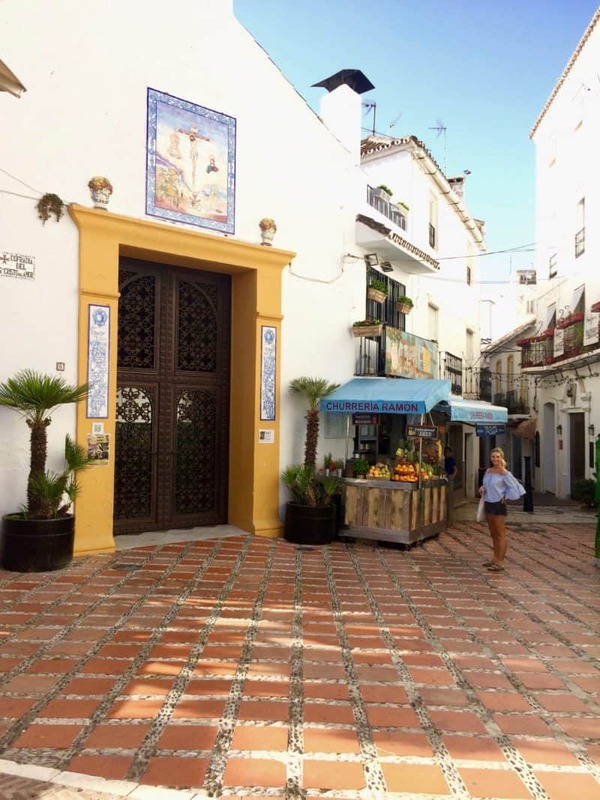 The tiny lanes of Marbella’s Old Town get busier as the days goes on – and by sunset, it is full of families and couples heading out for dinner and drinks. Marbella’s beaches stretch the length of the town and far beyond. I would certainly not say they’re the most gorgeous – some of the sand was quite dark and rough. Yet, they are of course, a wonderful place to spend the day although on July weekend days, they definitely get quite busy. If I had a hire car and more days, I would definitely head along the coast from Marbella and explore quieter coves and beaches. We spent a very pleasant morning in Puerto Banus, approximately 30mins by catamaran from Marbella and would highly recommend this. The small whitewashed town is full of the flashiest of boats as well as high-end shopping. It was the perfect spot for a morning coffee, but it was the boat over that made our day. A glorious journey where we even saw dolphins! It would be fair to say that Marbella is not short of fabulous eating spots. From quaint traditional restaurants tucked away in the Old Town to fine dining by the waterfront, you’re certainly spoilt for choice here. From €1 tapas by the beach, to some of the best churros in town at Ramon Churreria – you’ll eat well in Marbella. Ramon’s is a gorgeous tucked away stand with a lovely seating area in Plaza de los Naranjos. Together with the freshest orange juice in town, the churros come as a huge wheel and for just €5 euros – we couldn’t get enough of the food, OR the location! We tried all the gelato in town, as well as tapas in the marina too. I think Saturday’s dinner might have even stretched into a 4 location feast as the night stretched on. We enjoyed some fantastic seafood paella and local wine at the gorgeous Marbella Patio Restaurant. Not only is the food fantastic, but its location tucked away in little side street on a hill was perfect. Overall, Marbella was a fabulous weekend break and I could easily return. There are few destinations where I feel I could easily while away a full week, without really going too much! Have you been to Marbella? I’d love to hear if so, or if you have any suggestions for a return trip!! You get to visit such wonderful places but I love that you always offer fantastic tips – like the taxi’s being so expensive late at night. It looks truly beautiful in Marbella, a little bit of all the things I love! Added it to my travel wishlist! Ah thank you! I do try 🙂 It really is a beautiful place! Your photos are so beautiful! Marbella looks so gorgeous, I have got to travel there some time! Marbella looks really idyllic. Your pictures really capture how stunning the place is. It looks like you had a lovely time. Marbella looks so beautiful. The scenic beauty as well as the buildings, everything is incredible. I am loving the pictures, you look amazing. I am glad you had an amazing time there. Oh wow…. I can tell you had a blast. Thanks for sharing! I’ve been to Malaga but not to MArbella, thinking what you also thought before. But reading your post and seeing your pictures I might stop there in my next trip to South Spain! Definitely! Even as a day trip, it is definitely worth it! Totally agree that Marbella is great place to see even for just a day trip. In fact staying just outside will save the family money and exploring the area from that vantage point is a good idea if you’re on a budget. I will make it a rule to always arrange my trip from the airport in advance.